The 2015 Estate Chardonnay grapes developed during the fourth year of our recent drought cycle, but remarkably, the wine does not reflect it. After the previous two early August harvests caught us by surprise, we were ready this time. Knowing when to start picking—at just the right moment—is one of the hardest tasks a winemaker/ grapegrower has, yet it is the most fundamental. That decision sets the style and the delicate art of a wine. No other event in the year has this level of significance. The thing that sets Mount Eden apart from most Chardonnay producers, outside of Burgundy, is its ageability. It is the singular aspect that separates good from great. The best wines in the world share this one attribute: longevity. Good acidity also creates a wine that is slow to show its qualities which is why we release late. Our Chardonnay spends ten months in the barrel sur-lie and a full two years in bottle before release. The reticence that it displays early on is encouraging, along with knowing that the richness and complexity will emerge with time. This Chardonnay exhibits fresh acidity, minerality and leesy complexity. Expect full development by 2022. This classic bottling is still a baby and needs plenty of time to open. When it does, aromas of toasted hazelnuts, light oak, lemon pith and exotic apples show on the nose. The palate combines oak smoke with savory sea salt and sumptuous golden apple fruits. Drink 2019–2030. Cellar Selection. —M.K. Readers will find a gorgeous wine in the 2015 Chardonnay. Open-knit and radiant, with lovely suppleness, the 2015 will also drink well early, which is unusual for this wine. Tropical fruit, hazelnut, honeysuckle and orange peel give the 2015 a decidedly exotic feel. 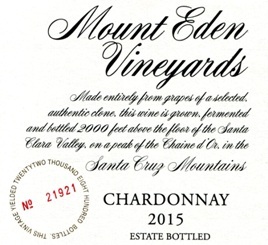 The Mount Eden Chardonnay is typically a bit more tense in style, but the 2015 vintage yielded an unusually accessible and – dare I say – flamboyant version of this wine.